James J. Tissot, "The First Nail" (1886-1894), opaque watercolor, Brooklyn Museum. Full image. The scene around the cross is crass and unfeeling. The soldiers are part of an execution detail, bored with crucifixion. Perhaps this team will have conducted several crucifixions this week already. The first time they saw a crucifixion they may have been moved by its brutality, but now they are calloused, emotionless. First, the soldiers begin with the cruel process of nailing the criminal to a cross, then hoisting him up, the cross swaying forward, then back until it is secured with wedges at the bottom to hold it upright in the hole. And when that task is done, they sit around the base waiting for the criminal to die -- sometimes for days. To pass the time they gamble, deciding by a casting of lots who will be awarded the victim's last possessions. That is the scene. What is Jesus saying? In his last hour, Jesus is saying a prayer, a request to God Almighty. It is remarkable, however, that Jesus isn't asking for himself! I would be terrified and overwhelmed, trying desperately to retain my composure. My prayer would probably be: "God help me!" if I could utter any sounds at all. But Jesus' prayer is one of complete unselfishness. He is concerned for the people who are responsible for crucifying him and is asking God to forgive them. Instead of thinking of himself and his own needs, he is thinking of those whose souls are in much greater peril than his own. The first thing I learn from this word is love. At his last extremity, Jesus loves. But his love is not merely for those base military functionaries who put him on the cross. His prayer reveals a gentle love for God himself. At the moment he begins the long course of death through excruciating pain, he speaks in love to the only One who can deliver him -- God himself! He speaks not for himself, but for others. And he speaks in love. Think about the word "Father" in this prayer and consider the alternatives. "God" is the generic term for deity. �"Lord" is a term of respect and honor for one who is exalted in rank. This term was substituted by the Jews to avoid saying the divine name of Yahweh or Jehovah when reading the Scripture. "Almighty God" would be a bit formal at the desperate hour of one's crucifixion, but it would express God's great power. "Creator God" is a common substitute for "Father" among Christians who want to avoid the paternalism they see in the word "Father." But "Creator God" is not a term of relationship, rather one of function and awe. "Father," on the other hand, is first and foremost a term of relationship and endearment. It is a family term. Spoken within the family circle it was often expressed as "Abba," which, roughly translated, might correspond to our "Dad" or "Daddy." Jesus had used this intimate Aramaic word to address his Father in the Garden of Gethsemane the night before (Mark 14:36). It is also the cry of the Spirit of God within us, helping us reach out to God (Romans 8:15; Galatians 4:6). In this prayer at his last hour, Jesus addresses the God of the Universe with the simple term "Father." And he invites us to do the same. When Jesus' disciples ask him how they should pray, he gives them a model prayer that begins, "Our Father..." (Matthew 6:9). By beginning his prayer with the word "Father," Jesus expresses at the same time a love and a confidence, a trust. One who doubts might pile up descriptors of God to buttress his shaky faith, but one who calls him simply, "Father," knows him, trusts him, and is confident in the outcome. Who Does the "Them" Refer To? Jesus prays that the Father would forgive "them." Who are "they" for whom he prays? Let's consider the possibilities. Soldiers. He could be praying for the Roman soldiers who routinely put men to death on this site of Golgotha. They destroyed a human life, brutally, without compassion, but they didn't initiate the action. They had no choice. They were merely following orders. Only after the fact did they realize with awe and terror what they had done: "Surely he was the Son of God!" said the centurion (Matthew 27:54). It could have been the soldiers he was forgiving. Pilate might have been a better candidate, however. Against all law he had given the order for the crucifixion. He had found Jesus innocent of the crimes with which he had been charged. Yet, the pressure of the Jewish leaders and his fear of a riot "forced" him to go against his own better judgment. He signed the death warrant and then publically washed his hands (Matthew 27:24) -- the crass, double-faced act of a self-serving politician desperate to hold onto power. Perhaps Jesus was forgiving Pilate for the weakness of his character. 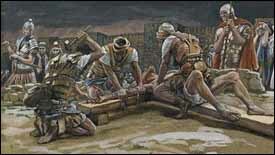 Chief priests and scribes were the prime force behind the crucifixion. Once Jesus had cleansed the temple of their greedy trade in animals and money changing at outrageous exchange rates, they were determined to kill him (Matthew 21:15, 23, 45-46; 26:3-4). Behind the scenes they had paid off Judas for his insider betrayal (Matthew 26:14-16), sent temple soldiers to arrest him in the Garden of Gethsemane (Matthew 26:47), tried to get people to testify falsely against Jesus before the Sanhedrin (Matthew 26:59), brought his case before Pilate (Matthew 27:1-2), and stirred up the crowd to demand that Jesus be crucified (Matthew 27:20-23). It may have been the chief priests and scribes that Jesus was forgiving. Pharisees and Sadducees were his early enemies. Jesus' plain teaching about the Kingdom of God offended them both. The Sadducees sought to discredit him (Matthew 22:23-34). The Pharisees were the first to actively plot Jesus' death (Matthew 12:14). I would guess that if Jesus came to our churches today, many of our leaders would oppose him openly. Some might plot to destroy him. The real Jesus is just too threatening to established religious power that resists change. It might be the Pharisees and Sadducees who were the recipients of his plea for mercy. You and I. But when you think about it, we are the real ones that sent Jesus to the cross -- our sins, our corruption, our weakness and pettiness. The way we're headed on our own is to our doom -- that's what Jesus says. The gate to eternal life is exceedingly narrow, he tells us -- so narrow that few find it on their own (Matthew 7:13-14). Without Jesus' active campaign to bear our sins upon himself, the Righteous for the unrighteous (1 Peter 3:18), none of us could be forgiven. You and I made the cross necessary. We are the ones he prays to forgive. Did We Know What We Were Doing? Does God hold those who put Jesus to death responsible for their sins? Oh, yes. He is a just God. They had seen Jesus' miracles and heard the Truth spoken by the Son of God himself and had yet sought his death. There was plenty enough rope to hang them with all justice. Paul himself, who persecuted Christians to their death, did it because he just didn't understand. What I learn from this First Word is that God is merciful -- far more merciful than any of us deserves. Yes, each of us has plenty enough sin to condemn us. But God is looking deeper. He has made a way that we do not deserve, because he knows that if we really knew the truth, we would embrace his Son. Jesus' prayer on the cross tells me that God has found a way to forgive us. This leads me to the last question raised by this saying: What does it mean to forgive? He is speaking of sins as a debt owed to God which must be paid. The Lord's Prayer asks God to cancel our debts -- as we cancel others' debt of sins committed against us. In the Parable of the Unforgiving Servant (Matthew 18:23-35) Jesus illustrates the concept of forgiveness in terms of massive financial debt owed to a king. I needed someone to wash my sin away. Also available as an e-book or paperback. That pretty well says it all. As Jesus begins the last phase of his life -- dying on a cross hung between earth and heaven -- he prays for all of us who put him there. He calls out to his Father, without any shame at the intimacy of his love and the authenticity of his Sonship -- "Father, forgive them." And so we pray the prayer ourselves: Father, forgive us. Yes, Father, forgive us. We really didn't know the depths to which we have fallen. And we are just coming to realize the depth of the love you have for us -- and have always had. Cancel our debt of sin to you, we pray. Not because we deserve it, but out of your great mercy revealed by the cross. For we pray this in the Name of Jesus who died on that cross to bring about just this result. Amen! Q1. (Luke 23:34) Who was most responsible for killing Jesus? What responsibility do you and I bear in this? In what sense was Jesus praying for us? What term do you usually use to address God? Why? How might your faith be affected if you started addressing God in your prayers as "Father"? How would it help you better understand the relationship between you and God? In what sense can your sin be seen as a debt owed to God? How do you pay off a debt like that? On what just basis can God forgive this debt of sin? What does knowledge of sin have to do with Jesus' forgiveness? At what level did Jesus' killers understand what they were doing? Who was most responsible for killing Jesus? What responsibility do we bear for Jesus' death on the cross? 1. Aphiēmi, BDAG 156, 2. 2. Rudolf Bultmann, aphiēmi, ktl., TDNT 1:509-512. 3. "He Paid a Debt He Did Not Owe," words and music by Ellis J. Crum (� 1977, Ellis J. Crum, Publisher; admin. by Sacred Music, a Trust).